The Doctor throughout his many lives has made no secret of proclaiming the Eye of Orion as one of the most beautiful and tranquil places in the universe, making it perfectly fitting that here it should be a secret Dalek research facility. With the Dalek Time Controller working in its own capacity after being forsaken by the Daleks at large due to the origins of its own existence, he has tracked Markus Schriver to the Eye and hopes to gain control of his gas that is capable of sustaining a mind beyond death and that will become the Eminence for himself. But as the corruption stemming from the retrogenitor particles as well as the effects of time being rewritten continue to spread with the Supreme Dalek’s forces mounting and a new Time Strategist based on Adelain Dutemps being commissioned, the Time Controller’s plans continue to fall apart as Schriver transfers his own mind to the gas and begins combat against the Time Controller when it tries to do the same. Naturally, the story of Dark Eyes must circle back to Molly despite the unfortunate absence of Ruth Bradley who so fervently made the role her own. To that effect, Sorcha Cusack continues to excel with this older version by wonderfully capturing Bradley’s intonations and mannerisms, but while it makes perfect sense that Molly should receive a grand sacrificial exit to end events once and for all, there isn’t quite enough work done and explanation offered to sell the fact that the Time Controller and she have become inexorably linked and that the death of one means the death of both. It does add an intriguing dynamic and quite rightly puts Liv in the difficult position of considering that Molly’s death may be necessary to ensure the Time Controller’s given the Dalek occupation she has lived through, but it just doesn’t carry as much impact as it might have in a different setting with more buildup. Indeed, a good portion of the story simply asks its audience to take events at face value without requisite explanation, and it feels like events ultimately reach their conclusion simply because the story was mandated to be sixteen parts. This is a bit strange given the obvious planning that occurred to craft the storylines of the second through fourth box sets, but this fourth set in particular has so far been filled with more disparate tales that do well on their own merit but don’t necessarily form a tightly interwoven narrative heading into this finale. Accordingly, the heavy use of technobabble that would seem odd in any story is particularly at odds with what has come before in this saga, and the Time Controller’s overly complicated plan to become the Eminence comes off more as a way to fill a void in the narrative without making the most of the unique threat the Time Controller poses. Despite narrative leaps taken to reach a conclusion, however, the very visual means by which the Doctor bursts onto the scene, the Doctor’s obvious disdain for the Dalek Supreme even when it rescues him, and stunning performances from both Nicola Walker and Sorcha Cusack in particular are undoubted highlights that hint at what this story could have been within a different context. These in addition to the wonderful moral debate stemming from just how far the Doctor is willing to go to save Molly’s one life compared to the billions that will be lost give plenty of reasons for this story to be remembered. 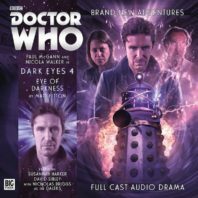 As a whole, however, ‘Eye of Darkness’ simply isn’t able to live up the weight of expectations and its placement as the finale of sixteen stories, delivering visually thrilling events and a grand goodbye for Molly that can’t quite deliver the intended emotional impact due to time constraints that by necessity include developing an entirely new setting as well.